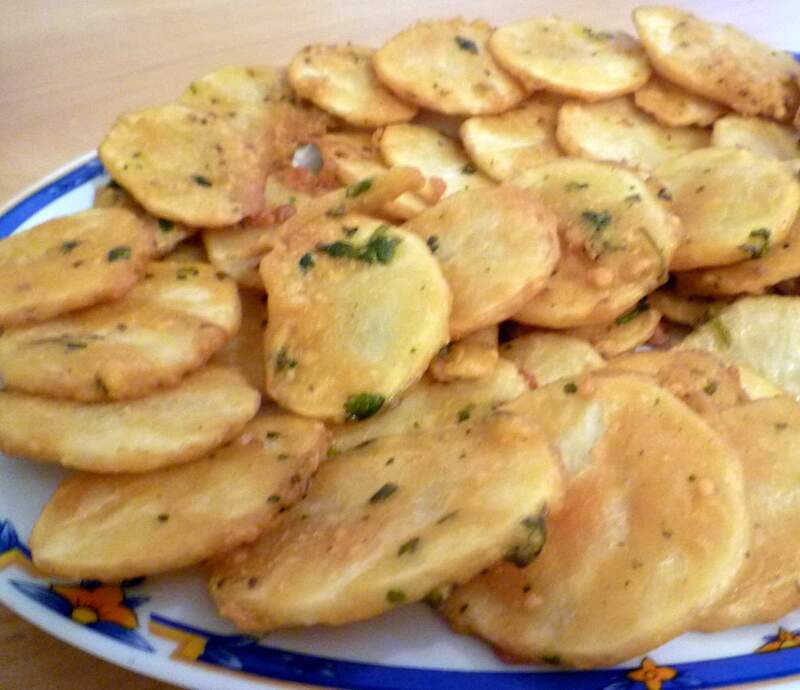 These crispy bhajias are also called Maru’s bhajia. Maru is the name of a restaurant in Nairobi and Wembley and they make these crispy potato bhajias which once you eat them – you never stop talking about them. These bhajias taste much nicer than the huge doughy bhajias you see in the supermarket as you can taste the vegetables and the spices. My recipe makes bhajias similar to Maru Bhajias. 3. Mix the salt, pepper, (chilli powder) ajwain and turmeric with the chick pea and rice flour. 5. Sprinkle some coriander, chillies and ginger mixture thinly on the flour mixture. 6. Drain the potatoes and layer them on top of the flour and spices. 7. 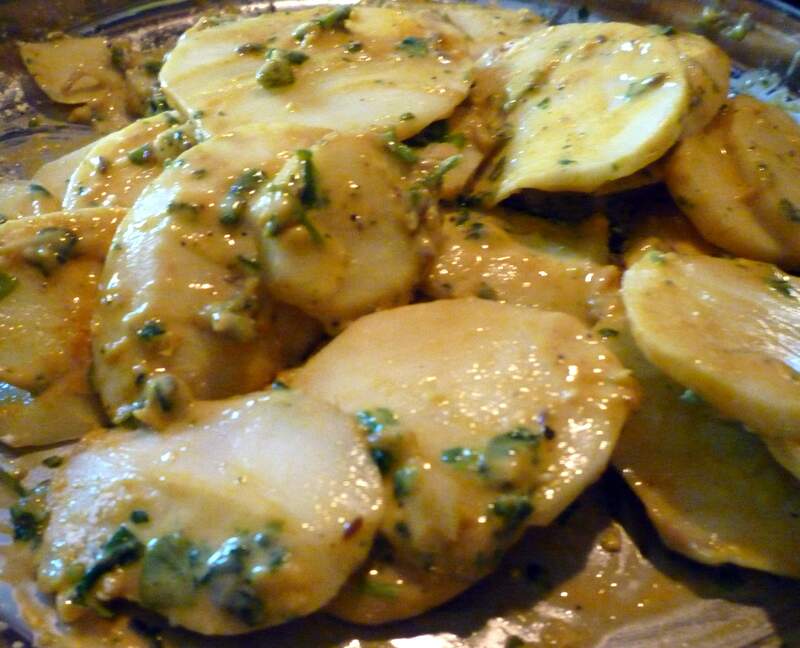 Sprinkle the flour mixture on top of the potato slices topped by the coriander, chilly and ginger. 9. Let this mixture marinate for 30 minutes. 10. Add the bicarbonate of soda to the mixture now and using your hands, mix the potatoes well until they all get thinly covered with the flour and spices mixture. 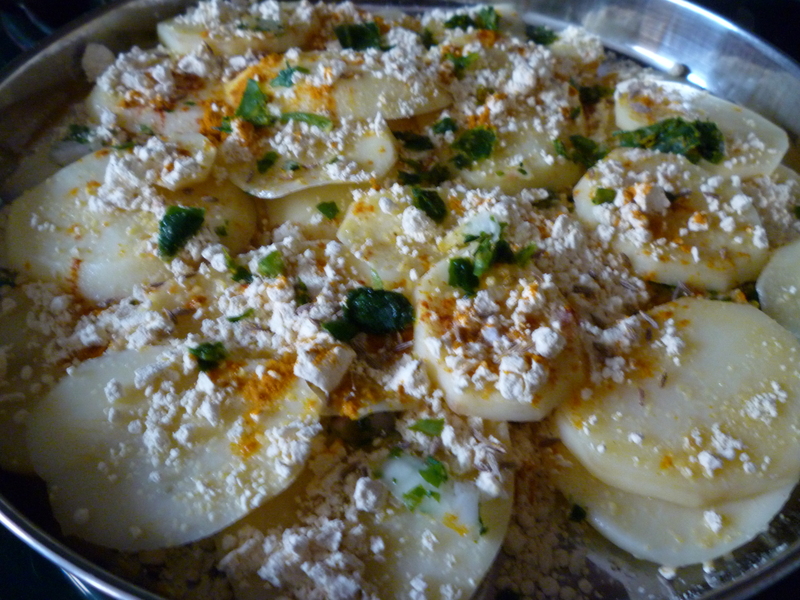 The salt and washed potatoes should create some moisture to enable you to cover all the potatoes with the spicy chickpea flour. If it’s too dry, sprinkle some water droplets into the mixture. 11. Heat some oil in a wok and fry the potato bhajias. Keep the heat high for the oil. Check that it’s reached the temperature for putting a couple of drops of the potato mixture. If it rises quickly to the surface, your oil is ready. Now lower the heat and fry the bhajias at medium heat to allow them to cook well and crispy. You may need to adjust the heat occasionally to ensure the bhajias become crispy. 12. Enjoy them with any chutney or dip. Tagged bhajias, indian, Maru bhajias, vegetarian. Bookmark the permalink. These look good. I am guessing that in the absence of additional water, they do not tend to become oily either. Would love to try these asap! I wanted to congratulate you for coming up with such a brilliant idea. These recipes that you have been positing are timeless.